I know it's not Music Monday, but I just can't help myself. I read these precious words in Lamentations this morning and knew I had to share them with y'all. I LOVE these verses, which is also why I LOVE the hymn "Great is Thy Faithfulness." I'd dare say that it is my favorite. I mean think about it- the steadfast love of the Lord never ceases. Steadfast as defined by Merriam-Webster: very devoted; firmly fixed; not changing; immovable. That is the very love of God. And on top of that- His mercies never come to an end! Mercy: kindness, compassion, blessings, forgiveness given when it is undeserved. Ephesians 2 paints a wonderful explanation of God's mercy. It starts by listing many deplorable things we as sinners do: following this world, and walking in darkness...verse three says: "we all once lived in the passions of our flesh, carrying out the desires of the body and the mind, and were by nature children of wrath, like the rest of mankind." But here is the good part- in light of all of that wickedness and sinfulness that we all live, God is still merciful to us. And that abundant mercy is given to us, brand new, every morning. We don't just receive God's mercy and grace once in our life for salvation, it's a continual process. EVERY DAY I need God's mercy and his grace and his love. Because EVERY DAY I am still a sinner. The difference though is that before I was saved I was a sinner in need of a Savior, but now I have a Savior who has completely paid in full the debt I owe because of the sins I commit. So where does mercy fit then? Well mercy is still needed every day, because every day God is still sanctifying me-- meaning He is setting me a part and making me holy; more like Christ. He is still giving me mercy when I act un-Christlike and He doesn't give up on me. Because Great is HIS Faithfulness! Are you celebrating every morning the great mercy and love that God gives or do you take it for granted? Are you seeking him daily so you can be more and more like Christ? Or do you feel like you have fallen too far? 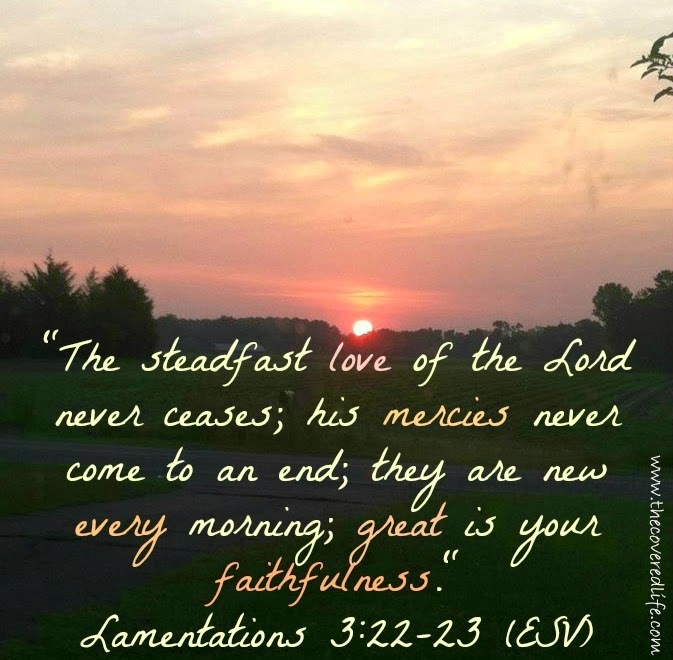 God is faithful and steadfast- seek him today!